The Mann Center of North Carolina has been described for many years as The Crown Jewel of Lee County. From it’s significant origins in 1925 as the predecessor to Sanford High School, to its present-day diverse role as an event & performance venue, office space, conference room, multi-purpose room & meeting space rental facility, and home to some of the county’s noteworthy non-profit organizations and artisans, the Mann continues to serve the residents of its community. When Mann opened its doors, it was as an 11 grade elementary & high school. From there, the building served as the home of Sanford High School for many decades, followed by a long-standing role as a middle school facility. 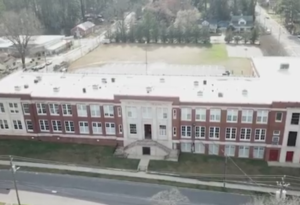 With the opening of new middle schools elsewhere in the growing community, Lee County’s traditional middle school closed its doors on this chapter of its life at the end of the 1976-77 school year. In 2015, by unanimous consent of the LCACC Board, the facility was renamed and dedicated as the Mann Center of North Carolina, in honor of Tommy Mann, in recognition of his many years of service and leadership to the organization.